pickling spice in a bag, to boil in the mix and remove and discard at the end. I decided to make chutney as a solution to the need to use up some of the crop of apples from the Catslide tree without interfering too much with the essential DIY needed to get us moved into and operational in the house. Trouble was that the apples were a motley collection of windfalls, coddling moth infested and good ones. The yield of useable apple to number of apples processed was very variable so I had to get out my [imperial] kitchen scales as I had no idea how much apple I had. So, first get your non-reactive pan [eg an enamelled one] and counter balance it on the scales. Add about 1.5kg of extra weight to the scale [3.3lb]. Now add the rest of the ingredients, including the peel of the lemons chopped up very small. Boil gently until the mixture thickens, about 2 hours. Stirring every time you pass the pot. I used a root ginger paste that came in a jar and found this very good [1/3 jar, 100g]. The only vinegar I could get of the required strength was wine vinegar and what ever it might say in the recipe, I used two bottles. I think this was probably better, but more expensive, than pickling vinegar. Taste the mix before bottling and adjust the salt and ginger levels as necessary. It will taste much more spicy at this stage than the final product so don't worry too much if it is a bit overpowering. Use my labeller option to make labels for the jars, or anything else. Just a few ripening [or not] on the window cill. No apple tree in our new garden but we have lots of green tomatoes and we still have a lot left even after using a kilogram of them in this recipe. 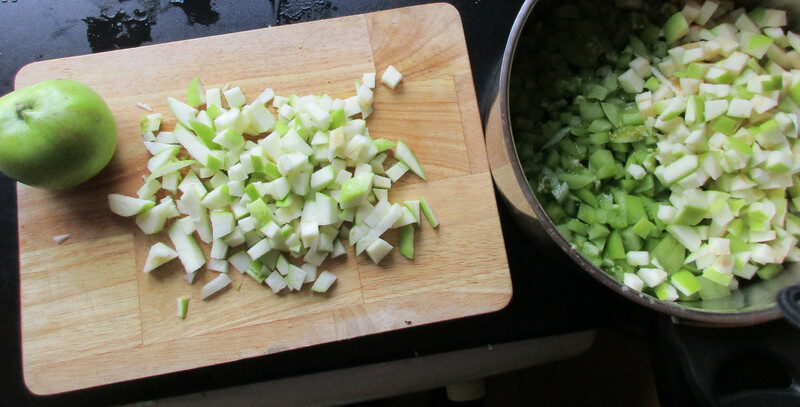 Chop the lot up into small pieces and boil together for about 2 hours until the mix has thickened. Taste to check the seasoning and adjust if necessary. Chop up all the ingredients. Boil together for about 2 hours. Still trying to use up some of our bumper crop of tomatoes, this time as a ketchup. The tomato flavour is so robust it easily stands on its own so the ingredient list could hardly be simpler. It needs quite a vigorous boil to start but take care not to scorch it as it thickens. The whole process in one slide. Six stations from top left: Bowl for the seeds and pithy bits in the middle of the tomatoes. Rosemary fries these up for her lunch, tomatoes awaiting the knife, compost bin for the stalks, cutting board with the removed seeds and pithy bits, SHARP knife and the cut up bits and the cut up bits in the pan ready to go. I am always reluctant to peel tomatoes even though it is relatively easy after they have been dropped in boiling water but I think that next time I make ketchup I will, as the ketchup needs a finer texture than even the small bits skin from fine chopping allow. Boil with care until the sauce is reluctant to slide off the back of a table spoon. The original 1.5kg of tomatoes when processed yielded 1kg of chopped tomatoes which resulted in just over 500g of finished product of which 100g was sugar. Was it worth it??? Yes I think so though it was a spooky time in the kitchen. It's Thursday and that means market day in Banbury. 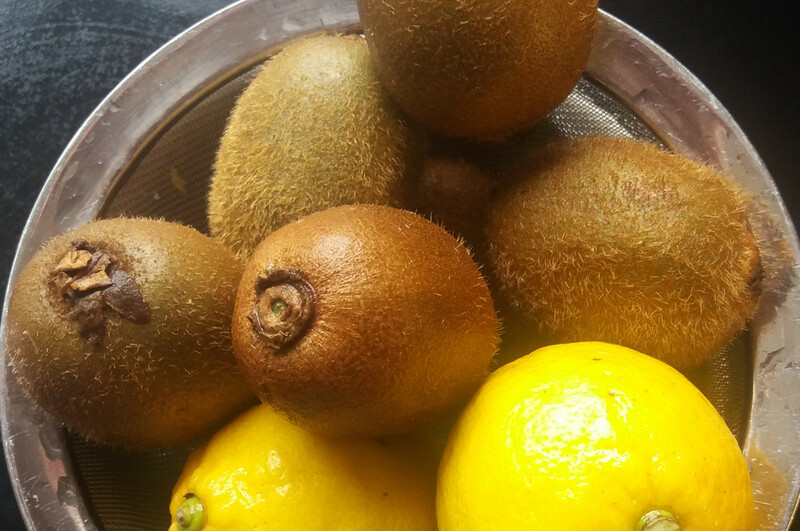 Noted that the vegetable stall still had [rather wizzened looking] Seville oranges but also £1 bowls of Kiwi fruit and as I was still in a jam making mode, even after making three batches of marmalade, decided to buy a bowl and another of lemons to go with them. Spent my walk home planning how to convert them into jam, even considered making marmalade with them but thought that their hairy peel might just be a bit of a challenge. Also mused about the first time I ever tasted them, in Bristol I think, with sister Ann who encouraged me to try this exotic fruit that she had met with on her travels and which I insisted was a Chinese gooseberry and which she said was a Kiwi fruit. Well I bit into one and then couldn't stop salivating the flavour was so intense. I thought I had found the holy grail of jam making so when I got home I bought some more and proceded to make the blandest, pithiest, seediest jam I had ever made and vowed never to try it again. So here I am carrying a bowlful home intent on making jam. That early experience was not wasted however, as I realised that the flavour is all concentrated just below the surface of the peel and that one can extract and throw away the tasteless inner core. 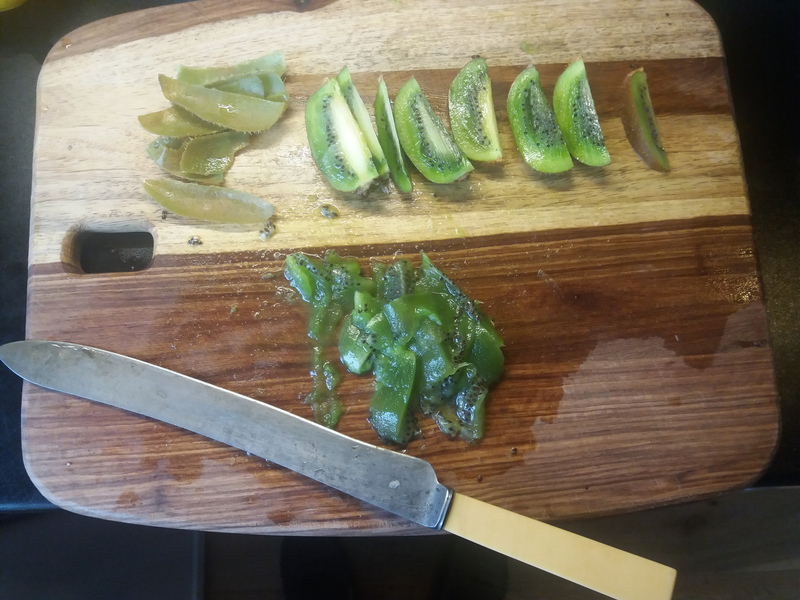 Cut the Kiwis in half and then cut each half into four more segments, avoiding the pithy core then scoop out the flesh, chop finely, scrape and discard the peel. 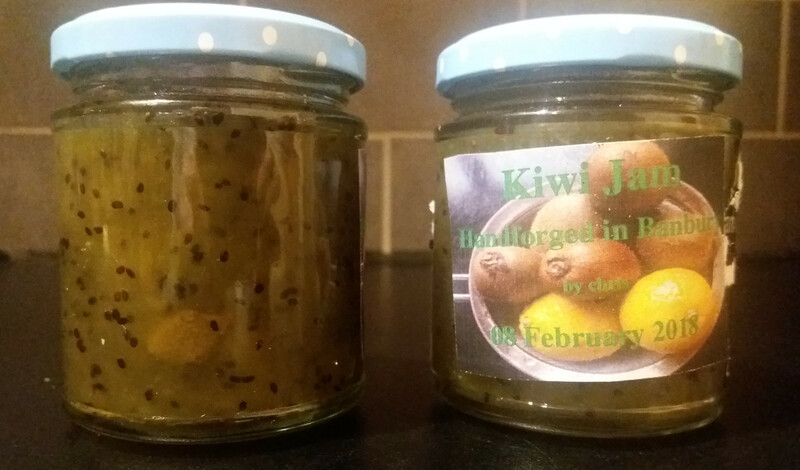 Don't be put off that the final jam looks a bit like frog spawn, it has a tangy taste and works well on toast or as an accompaniament to pork or game. Don't be put off that the final jam looks a bit like frog spawn. Our friend Alison came round yesterday bearing a basket full of quince. Our plan being to make 'pickled' quince, my tiny mind still being full of the surprise experience I had of eating them in a salad at Yottam Ottolenghi's restaurant in Islington. There seems to be quite a bit of conflicting advice on the internet as to how long to boil or bake the quince, a range of times from 30 minutes to two hours being quoted. Obviously, quince is a variable feast. We cooked ours until they were ready, ie al dente and that took about 35 minutes. Make up the sugar syrup. I did this in the same way I used to do for the bees. That is, pour the sugar into a large pan and then add water until it comes up to the original volume of the sugar. As I was using preserving sugar, with big crystals, this took me a little bit by surprise as the volume decreased much more than I was expecting so I may have added more water than was needed. The plan is to have sufficient syrup to cover the quince, but watch out because they float so this is difficult to judge too. Cut the lemon in half, squeeze the juice into the syrup and throw in the two haves. Add the pepper corns and the wine. 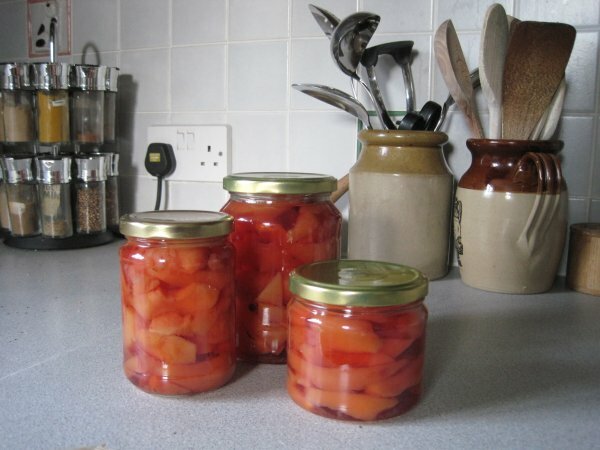 We transfered the slices to sterilised jars, Alison's being much more neatly arranged than mine, while the syrup was boiled hard on the stove to reduce its volume [By about a third]. We topped up each jar with the syrup and boiled them, in a water bath with their lids on loosely for 20 munutes or so. We fished each jar from the water bath, tightened its lid and left it to cool. Soon to be rewarded by the satisfying twang of the lids as atmospheric pressure bent their surfaces and sealed their contents. Thoroughly beat the egg yolks and mix in the sugar and then the lemon juice. Put in a pan and bring slowly to the boil, stirring the while. when pushed with a finger. If the eggs are not whipped enough or are very fresh, you may find that some of the white sets independently of the rest and you get white bits in the curd. The solution, sieve into sterilised jars. While stirring the lemon curd, I got to thinking about why I had only ever seen lemon curd, what could be wrong with orange curd, or grapefruit curd? So I decided I would give orange curd a try, by just substituting oranges for the lemons in the above recipe, I have to confess that I did include one lemon in the mix as I was slightly worried that there might not be enough pectin with just oranges. Actally, setting was no problem so you can make it with just oranges. To-day I have made a 4 fruit curd using grapefruit, orange, lemon and lime, the same citrus mix I used to make marmalade to-day as well. I'm pleased with the results. The orange does not have the 'bite' of the lemon but tastes of oranges [surprisingly] and the grapefruit mix has a very nice nip to it. As all are destined as Christmas presents, I've also got a new Christmas game which is to taste each other's jar and then negotiate swaps to attain the jar having your prefered taste. As this could easily lead to blows it should make for an exciting Christmas all round! Warning, this recipe is not WI approved!!! First find your Seville oranges, AND read the recipe that comes with them, then throw it in the bin. They mostly come in 1Kg bags now so that's the quantity I'm working on. At the same time buy two lemons and two 1Kg bags of preserving sugar. [Its worth getting preserving sugar as it doesn't generate lots of scum, make sure that it does NOT contain pectin, this stuff SETS!!!! The lemons especially are full of pectin]. You will also need wine and I suggest a bottle of a naughty Spanish wine though a box would be better as this takes regard for the environment, being bio-degradable cardboard rather than expensive glass. This will produce the necessary empathy with the oranges, so essential to the proper production of this product. 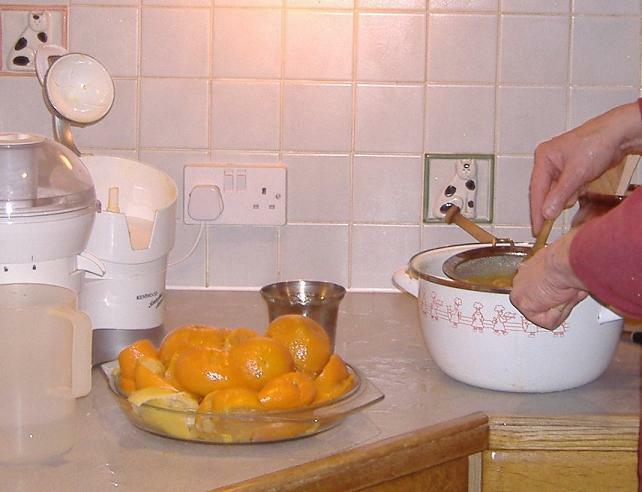 Next, throw the oranges and lemons into a big pan with 1.5 litres of water and boil the lot up for about an hour. Now let it cool, or burn your fingers. Open the wine, pour out a small glass and take a sip. Fish out all the boiled fruit and one by one, cut in half and extract the juice and contents. [This is so pathetically easy with the boiled fruit] Put the juice back into the pan, use a spoon to scrape the spiders and pips out of the orange halves into another container and then line up the bits of orange skin and cut as many at a time that you can manage into thin strips, and return those to the pan. I like a lot of peel in my marmalade, so if we have also been eating satsumas at the time I save their peel, cut into strips, and add to the brew at this stage. If you boil it in with the oranges it becomes too soft but works well when added at this stage. 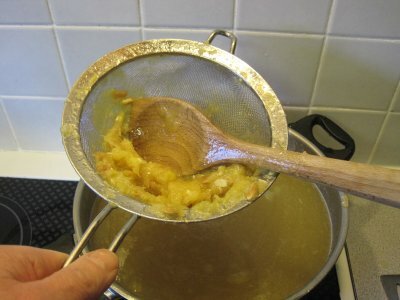 Use another half litre of water to wash the pips and spider pith, to extract remaining pectin, and run through a sieve into the pan. Throw the rest away. By now the wine should be disappearing nicely, if not you may have difficulty in getting the marmalade to set. Now heat up the pan again and add the sugar. Boil it with stirring until its ready. 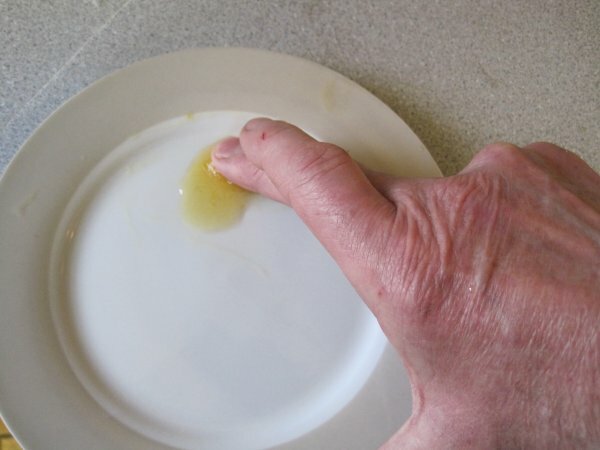 You could use a jam thermometer [104 C], or do the wrinkle test by checking now and again by pouring a little off a spoon onto a cold plate and seeing if you have a set. I have just treated myself to a new digital thermometer [bought from Thermometers Direct]. My old analogue one used to steam up and be unreadable at just the moment when its readings were most needed and although this could be an indication that the set point had been reached this does not strike me as a very reliable indicator!! I mentioned to tw that I was considering this purchase and he told me about their digital thermometer which is one of the 'stick' kind with the display close to the sensor. He said that once the pot got hot enough, the temperature was such that it blanked the LCD screen so no better than the analogue one in this regard. So I decided that a remote sensor was needed. Very pleased with this item, the only snag being the lack of a clip to stop it falling into the pot. I've solved this temporarily with a fork but will make something better for next time. In using it, I realised how important it is to stir the pot at this stage. Early on, it will register 104 C but a stir rapidly reduces this well below. The seting point is reached when the temperature holds at 104C when the pot is stirred. This is a good time to fish out any pips you missed and cut up the really large pieces of peel if even you think that they might be too big. As I am basically idle, once it has reached this state, I leave it uncovered overnight and then bottle it the next day cold into clean containers. I expect that it will be eaten quickly so do not aim for a standard of sterility that will enable it last for years...this is not the point!! Halve the citrus fruit and boil in the water for about and hour. Leave to cool. Gently squeeze the contents of each half fruit back into the pan and then scrape out the tough, pithy bits that remain into a sieve. Cut the peel into strips. Work the pithy bits with the back of a wooden spoon in the sieve to extract any fleshy bits that remain. Rinse with a little water and then discard. Add the sugar and stir well so that it dissolves and put the pan on high heat. Bring to a good rolling boil, the surface will be covered in white bubbles and if your stove is better than mine, you may need to be careful that it doesn't boil over. Convection will stir the pot for you at this stage. 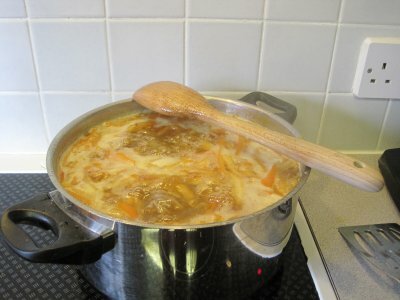 After a while the active bubbling subsides and the surface becomes more sullen as water is evaporated and the sugar and pectin react to creat the conditions that will lead to the marmalade setting. The pan will need stirring at this stage, to distribute the heat and to prevent burning. The aim is to boil the mixture until the setting poit is just reached. The best way to do this is by frequent testing by arranging for a small sample to cool and seeing what it does. One method is to use the wrinkle test, another is what I call the raindrop method. Try them both until you are satisfied that you have a set. Once this point has been reached, I remove the pan from the heat and allow to cool, uncovered, usually overnight, and then bottle into sterilised [dishwashed] jars. If you are planning to keep this for several years, not a good plan, it should be bottled and sealed immediately. To test if jams or marmalades have reached the point at which they will set. Put a small quantity on a cold plate, wait one minute, then tilt the plate towards the vertical. If it runs like a raindrop down a window pane it is not readt. If it moves sluggishly and looks lumpy, it should be ready for bottling. To test if jams or marmalades have reached the point at which they will set. Put a small quantity on a cold plate, wait one minute, then push it with your finger once it has cooled. If you see wrinkles appearing on the surface, it should be ready for bottling. By the way, its the jam that is supposed to be wrinkled, not the hands.